Someone’s been playing with my iPhone. Hmmm. Tap Tap Revolution, huh? I’m thinking it might’ve been a tween boy. Tap Tap is like Guitar Hero for the iPhone. Oy. 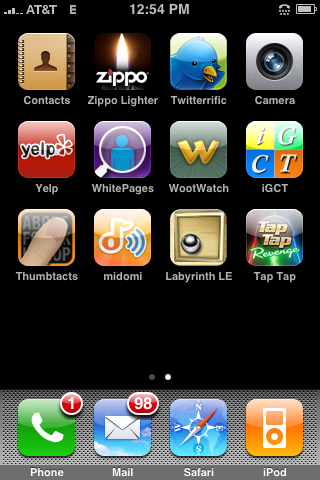 I don’t know about tap-tap, but I DO have zippo. And Flashlight. And koi pond, cribbage, Scrabble…Fine! I’m going to send my touch to your guys to customize for me. Hilarious. I guess middle child.